I’m tempted to begin and end this review with just one word: Huh? 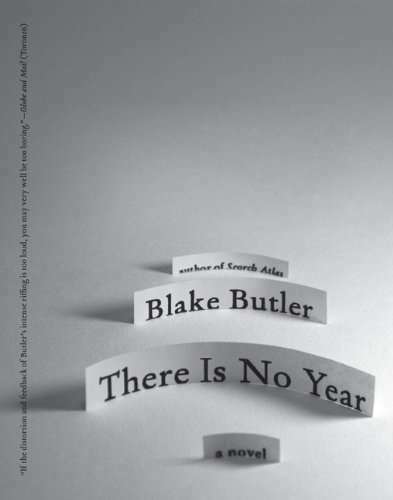 The truth is, There Is No Year by Blake Butler is one strange book and to attempt to explain any of it would be almost ludicrous. I’m not sure it’s a book that can be explained. But I shall make an attempt to say something about it, even though I’m still working out what it’s about and what I actually think about it. So, where to begin? Well, the book opens with a family—father, mother, son—moving into a home and finding a copy family that looks like them already there, each member of the family standing alone in a room, breathing but not speaking. Panes kept falling out of all the windows. Sometimes the sand that’d made the glass became apparent, insects sprawling in the grain. The tires on the family car would have flattened many mornings. The welcome mat would melt in too much light. The birdbath teemed and toppled. The dishwasher would seem to speak. Nothing ever seemed to line up with one another. The son could not walk from one room to another without bumping his elbow, nicking his shoulder. He often heard people speaking in the vents, grunting or gunplay on the roof. The house would not keep still. Just as the house doesn’t keep still and behave as a house should, so does this book. The paper is not white but varying shades of gray. The type is not laid out conventionally; instead, it sometimes appears as narrow columns of text, running down the center or right-hand side of the page. At one point, the main text is nothing but footnoted commas, with the “story” appearing in the notes. The reader is kept on edge, uncertain. Is there a pattern to this? Or is the feeling of being off-kilter the point? The book seems to resist any efforts to pin down the meaning, and I suspect there are several readings that would make a certain amount of sense. Is this a literal haunted-house story? Are the family’s experiences hallucinations or dreams? Is the whole thing metaphorical? The answer may in fact be yes to all of these questions. I have my own theory about what’s going on, informed in part by my frequent viewings of a particular acclaimed 1980s horror film that is specifically referenced a couple of times in the book. But my theory, which encompasses lots of the disparate images that appear in the book, still doesn’t take everything into account. And this brings me to the niggling little voice in my ear that keeps me from fully embracing this book. As much as I love ambiguity, I also like knowing that the author has a narrative or thematic purpose for everything he or she does. It’s the difference, in my mind, between the taut, disciplined storytelling of Buffy the Vampire Slayer and Dr. Who and sprawling messes of Lost and The X-Files. Don’t get me wrong, I enjoyed Lost and adore The X Files, but I never had confidence that the creators knew what they were doing. A lot of material seemed designed merely to keep viewers guessing. It felt like they were making it up as they went along and throwing in things that seemed cool or weird. I can’t help but wonder whether Butler is doing the same. But if he is, does it matter? Maybe it doesn’t matter. Maybe, with There Is No Year, that feeling of uncertainty is entirely the point. 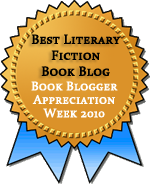 In the world of the novel, certain universal fears come to terrifyingly literal life. And our fears aren’t tidy; they don’t all have a purpose or fit a narrative. It would take multiple readings and discussions with others (I’d love to discuss this with others!) to unearth precisely what all the images and strange happenings in Butler’s novel are meant to represent, but I think they do have meaning, sometimes multiple meanings. And together, these images leave us wondering how well we understand ourselves and our fears. Or something. I’m still not sure. Am I correct that you didn’t get on well with White Is for Witching? Because I read that right before reading this, and the Oyeyemi is downright straightforward in comparison. Still, I almost want to tell you to read it because I want to discuss it! I was being coy about the movie because I didn’t want to set future readers’ minds in a particular direction, but here in the comments, I’ll fess up that I had Poltergeist in mind. Laurence Sterne! Tristram Shandy! The black page, the blank page, this squiggle, that squiggle. Not gimmicks, not remotely. I think your conclusion sounds right about the book. Uncertainty in life can be strange and frightening. Sounds like a perplexing book though. Yeah, I think the overarching metaphor must be one about uncertainty and unpredictability. The book makes you feel that same uncertainty. Well, I have to say, as nebulous as this book is, you’ve really intrigued me because the premise is just so odd. But I completely know what you mean about having trust in the creator of these wild, winding stories… I need to believe that even if the author isn’t sharing everything with me, that’s a matter of choice and not simply because they don’t have the answers either. If I feel like an author is just guessing and doesn’t have any real drive or goal behind his writing other than to confuse or befuddle, I find that extremely annoying. Your review almost makes me want to read this – but only almost… It sounds like it was influenced also by Mark Z Danielski’s mega-weird horror novel House of Leaves. This is also totally ambiguous, and confusing and plays around time as well as with type, fonts etc. As much as it was a real effort to read (some years ago mind), and I wasn’t sure what actually happened in it, I rather enjoyed it in a strange sort of way, and this book sounds rather similar. From what I’ve heard about House of Leaves, I think it must have been an influence. “Enjoyed it in a strange sort of way” is a pretty good description for how I felt about this! This sounds really intriguing. I’m still undecided about these sort of ‘avant garde’ books where their art literally transforms the book (like ‘Light Box’ by Shane Jones which I quite adored). I loved Lost and even more so with their literary allusions. The first season and the later seasons were excellent story telling, particularly season 4, but seasons 2-3 were plain annoying and, like you said, only written to keep watchers guessing. I find these kinds of book fascinating, but sometimes I do wonder how much is a gimmick. Light Box is on my list! Lost did have some great moments, and I think I agree that the first and fourth season were the best. Everything seemed purposeful, even when I couldn’t tell what the purpose was. I tend to love weird, and compelling images. This is going on the list. But I also do know what you’re saying about confidence or lack thereof in the author or creator of a piece – do they have an overarching vision, or are they just throwing in some weird stuff for the sake of weird stuff? Your analogy of Buffy vs. X-Files is spot on, I think. If you read it, I really want to know what you think. I NEED to discuss my theory with someone! I adored, really adored The X-Files, and I still consider the standalone monster-of-the-week episodes some of the best TV ever. But the mytharc got more and more exasperating as the series went on, and after about five seasons, it fell apart completely. Joss Whedon showed how to plan a mythology that was full of surprises but felt like a story. I think I would be exasperated by the book. I too like having the feeling that the creator is in control. I was sometimes exasperated, sometimes fascinated. I’m not sorry I read it, despite my uncertainty about it. You wrote this review quite a while ago, but im hoping that you still have the story somewhat fresh in your mind. I just finished “There is no year” and i am desperate to talk to someone about it. I was hoping it would be a book where in the last ten pages some how it would all come together, but i was mistaken, i closed the book just as confused as i began it, but im intrigued, and almost want to read it again, maybe i missed something the first time? anyways, ide love to hear back!